Now in their eighth year, the RAF Awards were the first of their kind and the format has since been adopted by both the Royal Navy and the British Army. The RAF has proven time and again its commitment to apprenticeships. In December 2014, Ofsted graded RAF Apprenticeship provision as ‘Outstanding’ in all areas. More recently the RAF was recognised as the Macro Employer of the Year at the finals of the 2017 National Apprenticeship Awards and holds a place in the Top 100 Apprenticeship Employers list published by the Department for Education. The RAF is proud to be providing the next generation of trainees with world-class skills and opportunities. This spans a wide variety of trades, to young people from a multitude of diverse backgrounds. We up-skill, re-skill, accredit, reward and value our people, improve social mobility and contribute internationally to the UK’s reputation and prosperity. The winners and highly-commended nominations for each category will be detailed over the course of National Apprenticeships Week. SAC Gabrielle Watt – RAF Benson Survival Equipment Specialist. 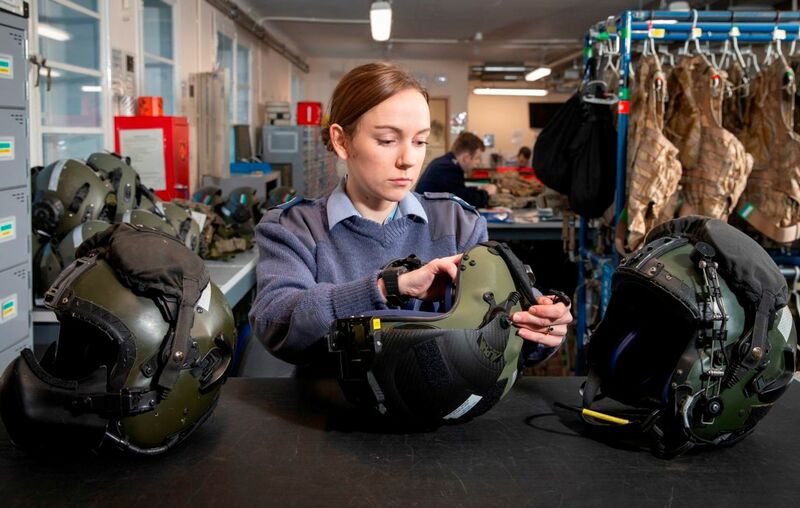 Since qualifying as a Survival Equipment Fitter, service at the RAF Benson Survival Equipment Section has provided SAC Watt with the platform to fully showcase both her effective intelligence and engineering skill set. Since completing her Apprenticeship quickly and efficiently, she has gone on to undertake a Defence Workplace Trainer course significantly contributing to the Section by training new team members. Always professional showing experience belying her time in rank, she was the obvious choice for the Puma Force Exercise Rising Panther; one of a series of exercises designed to train 1 Group assets with support from both 2 and 38 Groups. Carrying out her first exercise with enthusiasm, she assisted in the preparation and planning prior to deployment by ensuring that Survival Equipment and Aircrew Equipment Assembly piece part spares were available at the forward base location. SAC Watt provided unwavering support to enable a Puma Force Combat Recovery Mission to be successfully achieved; fully demonstrating the force’s Joint Personnel Recovery capability. SAC Watt is an excellent role model and ambassador for both the Survival Equipment Fitter trade and wider Service. Promoting an excellent image when presenting to groups from outside of the Royal Air Force, her work with the community does not go unnoticed. Unwaveringly dependable, she volunteered for an Annual Cadet Muster held in Scotland; deploying with a team of nine personnel, she was instrumental in ensuring that Air Experience Flights for over 1,500 cadets were achieved, during a two-day period, at Leuchars airfield. In addition, she also supported an Annual Youth Muster at RAF Benson by provisioning Aircrew Equipment Assemblies for Air Experience Flights to over 750 visitors; a feat also replicated for immediate dependants of Service personnel during the Station Families’ Day. During his Apprenticeship at RAF Cosford, SAC(T) McKie’s efforts were recognised by a series of ‘good show’ awards and excellent exam results culminating in the honour of the Silver Salver at Graduation. Since that point he has become a highly effective member of the 6 Squadron Avionics team, RAF Lossiemouth, in a notably short timescale. Relied upon to undertake complex aircraft fault rectification post diagnosis and a critical member of the Quick Reaction Alert team, he actively contributes to the defence of UK airspace. His keen social conscience is ably demonstrated by his active involvement in Charity events recently typified by team participation in a gruelling Marathon raising £5,000 in the process. In addition, he is a dynamic personality on the Junior Ranks Welfare Fund and the Station Magazine team; both groups promoting and supporting the wider Station community.